“A picture is worth a thousand words.” Couple that with more than a thousand words about nearly 120 different aspects of Buddhism and you’ve got the Illustrated Encyclopedia of Buddhism. Ian Harris, the consultant editor, along with Helen Varley, Peter Connolly, and Stefania Travagnin present the wide variations of Buddhism around the world. For those who think all Buddhists travel the Middle Path the same way would do well to begin to better understand Buddhism through this book. This encyclopedia should be used as a sampler buffet of what makes up this ages old belief system; then anyone interested could seek out further information. As the subtitle states this is a “comprehensive guide to Buddhist history, philosophy and practice”. The stunning photograph of the Wat Mahathat statue of Buddha in Sukhotai, Thailand is just the beginning of the amazing images throughout the book, each with descriptions. The pictures range from a beautiful Japanese woman in traditionally elaborate dress performing a tea ceremony, to Theravadan monks in traditional robes chanting in a garden in England, and Malcolm Browne’s capture of Vietnamese monk Thich Quang Duc’s self-immolation in 1963. All of the photos are appropriate to the sections they appear in. Like any encyclopedia the editors were limited in how much information could be presented on each separate subject. Kudos to them for making use of contemporary scholarship whenever possible while still giving the nod to people like Alexandra David-Neel and John Smith whose early studies still help us understand the complexities of Buddhism. Also, like any encyclopedia the limited space means they couldn’t tell the “whole story”. This isn’t the definitive knowledge on any of the subjects but should be treated as an outline for anyone looking to learn more. For a book published in 2009, and one that has updated information on the protests in Myanmar the editors did leave out an important aspect of Buddhism in this century. There is no mention of the rise of more Western oriented Buddhism, American Buddhism in particular. Ethnic, traditional Buddhist schools that have emigrated to America are important to the spread of Buddhism but it may be the American Buddhist groups that allow it to thrive here. A reader unfamiliar with the distinctly different forms of Buddhism could be lead to believe that all Buddhists believe in The Buddhist Universe as presented in the section What the Buddha Taught. Some Buddhist cultures do adhere to this belief while others do not. They also miss a core principle in Buddhist philosophy in Cause and Effect. Directly linking “dependent arising” to karmic cause and effect as it relates to the concept of rebirth ignores the Buddha’s teaching of causality that is an encompassing aspect of the universe. Overall, The Illustrated Encyclopedia of Buddhism is a valuable way for a reader to gain knowledge about Buddhism and the people who practice it around the world. The photos and illustrations are not only beautiful to look at there are lessons to learn from each of them. There is also a nice glossary of Buddhist terms. 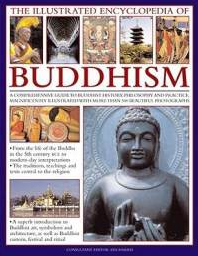 The Illustrated Encyclopedia of Buddhism, Consultant Editor: Ian Harris, Lorenz Books, 2009, 256 pgs.